Camden firefighters battled 14 fires in the Whitman Park area last weekend. Three people were displaced, seven firefighters were injured, six of them minor. Police announced an arrest Friday. Police announced they have solved the serial arson spree that plagued the Whitman Park neighborhood of Camden last Saturday and Sunday. Arrested is Charles E. Ricks Jr., 43, of Camden, it was announced at a Friday press conference. He is charged with 14 of 16 fires set over the weekend. The two remaining fires were vehicles. Authorities say they are looking at additional suspicious fires Ricks may be linked to, as well. He has a prior arson conviction in Philadelphia, according to a police source. In that case, he burned down a property of his then-girlfriend. Using descriptions from citizens, police then pored over 100s of hours of video and identified the man as he traveled the city, allegedly "terrorizing" Camden. That led to a timeline. The man was seen by an officer walking down Federal Street and brought in for questioning yesterday. Police said he has confessed. He is jailed, held in lieu of $200,000 cash bail. Authorities believe he acted alone. Ricks posed "an extreme risk to the public," before his arrest. Police would not say if he possessed arson tools or an accelerant at the time of his arrest. One firefighter has a broken or dislocated thumb, another suffered carbon monoxide poisoning has had some cardiac issues. The 14 fires Ricks is charged with starting in Camden last weekend led to injuries to seven firefighters and displaced three people. One person was rescued from a roof. Most of the fires were in abandoned or vacant homes. While nowhere in Camden is immune from vacant buildings, Whitman Park is dense with derelict buildings. The county is moving to assist Camden with pursuing housing code violations and then go after slumlords who own many of Camden's buildings. Fire Chief Michael Harper acknowledged that abandoned buildings are a problem in the city. He said many homes look secure from the front, but are wide-open in the rear. He encouraged neighbors to report problem properties. The city has a huge issue with abandoned properties. It repeatedly bungled attempts to begin a systemic demolition program in early 2015. Camden had promised to tear down more than 500 buildings within a year. But only a handful of properties were successfully demolished by the city before it gave up. Unable to manage demolitions on its own, the city eventually had relinquished control the program to the Camden County Improvement Authority. The county has since torn down about 500 buildings. While the county has move forward with demolitions – thousands of empty buildings, tempting targets for arsonists – remain standing after decades of neglect. In 2014, a non-profit group estimated that at least 15 percent of the buildings in the city are abandoned -- about 3,000. 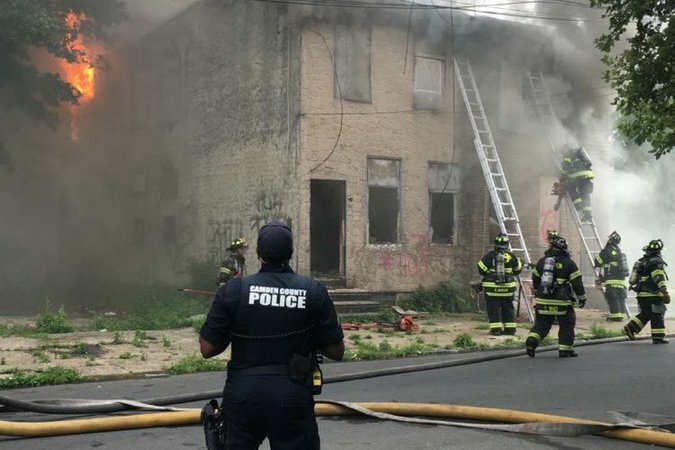 The issue of derelict buildings is a constant threat to the safety of Camden firefighters, according to a firefighter who spoke Friday on the condition of anonymity. “We were packing hose and riding to the next fire,” throughout the shift, said the firefighter. “We got more experience in 10 hours than most firefighters get in a year,” he added.